Rap group Insane Clown Posse doesn't just make records and court controversy. The entrepreneurs make clothing and energy drinks and even have their own wrestling league. The Insane Clown Posse is one of the most successful bands you may have never heard of. The group thrives in a world of music of their own invention: horror-core rap. The group has been around for almost two decades, starting in Detroit in the early 1990s, under the name Inner City Posse. The name changed when the group's frontmen, Shaggy 2 Dope and Violent J, started wearing clown makeup to stand out in a crowded field of Eminem wannabes. 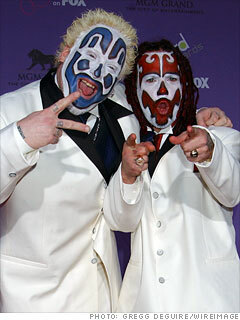 Outsiders have never taken ICP especially seriously as musicians. They've flirted with major labels who are keen on tapping into the group's ardent fan base and album sales, but for the most part ICP has published their violence-inflected hip-hop albums on their own label, Psychopathic Records. The duo has earned two platinum and five gold albums. Hello Kitty? Hello hangover. 5 celebrity boozes. When it comes to celebrity-branded products, it looks like alcohol is the new fragrance. From '90s teen pop sensations, former NBA stars, to fictional characters, here are a few recent celebrity entrants to the booze business.